Google appears to be planning an interesting set of gestures for its Glass project, letting you use your fingers, head, and eyes to perform certain functions. Two examples include being able to use two fingers to zoom in and out of the browser, apparently just like on a touch device, as well as winking to take a photo. The most interesting mentions in our opinion include HEAD_GESTURES, EYE_GESTURES (including WINK_TAKE_PHOTO), BROWSER_TWO_FINGER_ZOOM, GUEST_MODE, and COMPANION_SCREENCAST. Given that the first two are categories, one could assume that there will be multiple types of each, even though there is only one of each listed right now. The last two suggest Glass users will have the option to share the device with others without fear of giving away access to their personal stuff (we’ve heard about this before) as well as send over a stream to their friends showing off what they’re currently up to. These features could of course never see the light of day, but the fact Google already seems to have code for them seems to suggest they are at the very least being tested by the company. 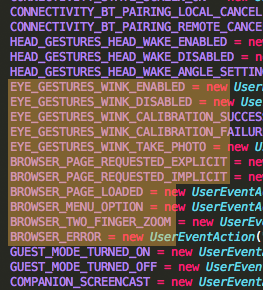 The head gesture name seems to imply putting Glass to sleep and waking it up. The eye gestures meanwhile can apparently be calibrated or even completely disabled (in fact, they will probably be off by default), which makes sense as you don’t want to be taking a succession of photos just by blinking. Although fodawim said he would update the Reddit community with anything else he found, his submissions suggest the code hasn’t pointed to anything else. He did note two minor details in the Glass terms, however, but that’s about it: Glass will be made by a third party but feature support from Google as well as have a dedicated website for purchasing the device and accessories. Multiple interesting leaks have surfaced as of late in code Google has released to the public. Some speculate these are controlled to build up hype. If not, it’s simply a wonder the company can’t keep all these tidbits on lock down.